Hey guys! I'm off to the Twin Cities for an extended weekend in celebration of my hubby's 25th birthday! This lovely lady is going to share a great post with you while I'm away! Erica from being erica will be sharing some lovely interior inspiration! Take it away, girlfriend! hi guys! for those of you that don't know me, my name is Erica and I blog over at Being Erica. I have been reading Autumn's blog for ever, so was over the moon when she asked me to guest post while she's off on holiday... who's luckier?! me, obviously! so, at the moment, I live with my boyfriend in a two-bedroom flat in suburban London. it's great! except.. we live with our 35 year old landlady, who is a bit crazy. she's loud, messy and finicky about errthang. it's... less than ideal. now, it hasn't always been this way! once upon a time we were happily housed; she lived overseas and the flat was clean, tidy and peaceful. but then she moved back. and ruined my life. long story short, we're moving out. boyfriend and I found a really great 1 bedroom flat, closer to the city and our friends, in a nicer area and a branch of my favourite coffee shop across the street. all signs point to yes! except... the flat comes unfurnished, and we don't own any furniture. but! this means I get to go shopping! I will admit, I am somewhat of a regular shopper, so it might make a nice change to buy some homewares instead of more dresses that I don't need. problem: furniture costs lots of money! solution: buy lots of second hand stuff from local flea markets or charity shops! result: amazing, unique and individual pieces! In a bid to gain some inspiration, I turned to my good friend the internet, and then got sucked into a world of vintage and retro homewares on polyvore. then I made too many furniture sets. below you will find what I decided my new bedroom is going to look like. I hope boyfriend doesn't read this post, because I'm very sure this is not what he had in mind. 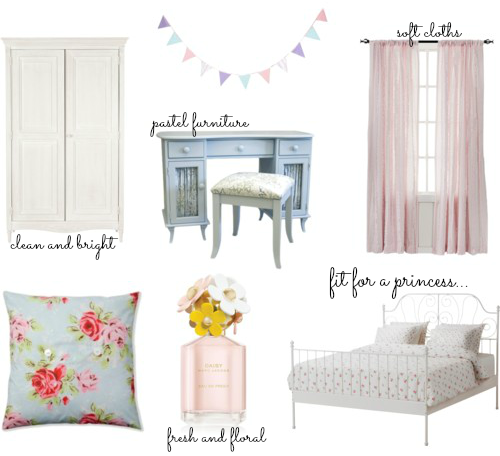 pastels and florals rule my world, and that bed (Ikea - so cheap!) is fit for a princess! this room is reminiscent of an English country cottage, pristine and pretty, and I just adore it. and I want it all... sigh, maybe one day. this next set came about when I was scouting a retro Smeg fridge. I had no idea that you could get them in pastel colours! now, although the new flat does come with a fridge and stove, the fact that I can mix and match them in any colour I like.. well that's an irresistible thought! 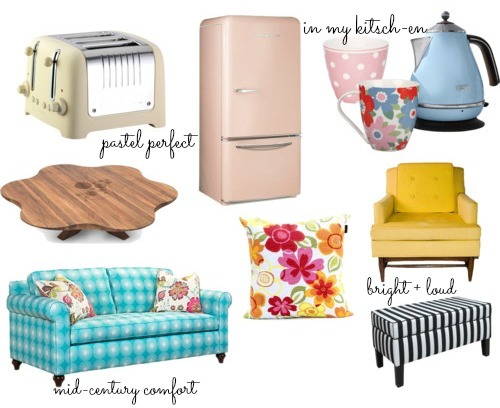 I absolutely adore that aqua sofa, and the cushion! oh, the colours in that room would be 100 times brighter, because while I need serenity in my sleeping room, I need to lounge in colour and comfort. and doesn't that room scream comfort?! well, it certainly screams. I stopped there, because I was getting light headed and needed a Diet Coke. perhaps I will wait now until we move into the new flat before I start window shopping again, it's taking over all my spare thoughts (and most of my working day). Wouldn't it be divine to have a home decorated like that?